The Brez snoring device takes a very different approach to a familiar problem. This is a solution for your nose. They claim you can solve your snoring problem by opening up your nasal passages. Are they right? Make your own conclusion here. Snoring issues are not anything new. 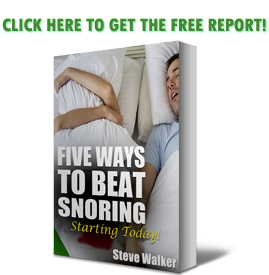 While not heavily documented until recently, snoring has always been a problem for society. Snoring is usually caused by a breathing issue. Sleep clinics around the country have seen that there really is not one singular cause for snoring. However, they have been able to narrow down the identification process to a few key areas. A collapsing throat is what causes most snoring issues. Other snoring issues can be more severe, as shown with central sleep apnea. Central sleep apnea is not as common as obstructive sleep apnea'”the root of most snoring problems. The Brez nasal breathing aid deals with your nose. They open the nasal passages. While it may work for a small selection of snorers, particularly those with septum issues, my immediate impression is that this product fundamentally fails where others have succeeded: in the throat area. On their website, they claim 50% of snoring is caused nasally. Being a snorer myself, and having tried'”and reviewed'”many products, I can confidently say that this number is not accurate. Not even close, Brez. What I have heard is that 49% of statistics are made up on the spot. Do you see what I did there? BESTMED, LLC is located in Golden, Colorado and is the parent company behind the Brez Premium Nasal Breathing Aid. Their roots place them back to 1982 when the price of a gallon of gas was 91¢, and the postage stamp peaked at a mere 20¢. They have been in the business of manufacturing consumer health products ever since. That gives them more credibility as a company than many others I've seen. Most snoring device manufacturers have been marketing their products for only the last 10-15 years. Add another 18 years, and you get the age of BESTMED: 33 years in business. That is not a number to scoff at. They are an American business, with products in every major consumer-level pharmaceutical setting in the United States, including Target, Wal-Mart, CVS, Rite Aid, Longs Drugs, Safeway, and Kroger. That is a much longer list than many other anti-snoring solution providers. This is a solution that opens the airways of your nasal passages, i.e., it stretches and opens your nostrils so more air can be accommodated. What you'll find when you open the product are two small silicone rings that you stuff up your nose. They are flexible, so initially it does not hurt to place them. At the same time, they are stiff enough to modify your nostril openings. The rings sit at the very opening of your nose. If you think that is where your snoring problem is caused, then it might work for you. However, the vast majority of people who have snoring issues find that snoring is a throat issue, not a nose issue. The overnight experience with Brez was lacking. It did not hurt to wear, but it was noticeable. Furthermore, it did not open my nasal passages enough to compensate for the material itself being in my nose. Halfway through the night, I took them out because it just wasn't doing it for me. Additionally, my nose started to run in the middle of the night while using Brez. You know how if you hold your mouth open long enough, you begin to salivate? The same principle applies here. Shoving something up your nose, more often than not, is going to make it run. The rings are attached in the middle, so you cannot put them too far up your nostrils. I imagine this was added to keep your nose from “swallowing” these rings in the middle of the night. Yep. That stuff can happen. 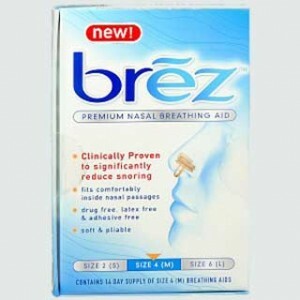 While some people swear by the Brez Nasal Breathing Aid, others seem to echo the experience above. As a writer with a good deal of review writing experience, I can usually point out phony reviews designed to create hype. Those reviewers that say the Brez helped them get “the best ever night’s sleep?” I'd like to see how they got it to work for them. For some people, the Brez may work, but it only seems to work if their nostrils were naturally small to begin with. We'll leave it to you to judge the effectiveness of the solution. The product has earned some positive reviews. The product is far safer than it is effective. As stated earlier, the rings are connected in the middle, and you insert a ring in each nostril. Unless you break it, there is very little fear of losing the rings within your nasal passages. BESTMED is based in the United States, which puts them under American regulatory scrutiny. I recommend buying Brez through Amazon if you think this might work for you. Unless you’ve been living in a cave, you know that Amazon has a substantial history, top-notch customer service, and a very strong return policy. If you do find this is the solution you are looking for, expect to pay about $25 per month to keep them stocked in your medicine cabinet. Yikes! This is another case where I have to recommend a pass on the product. Most people who legitimately review anti-snoring devices seem to agree with this. Evaluate your own circumstances, and try it if you like. Read more about the company here.